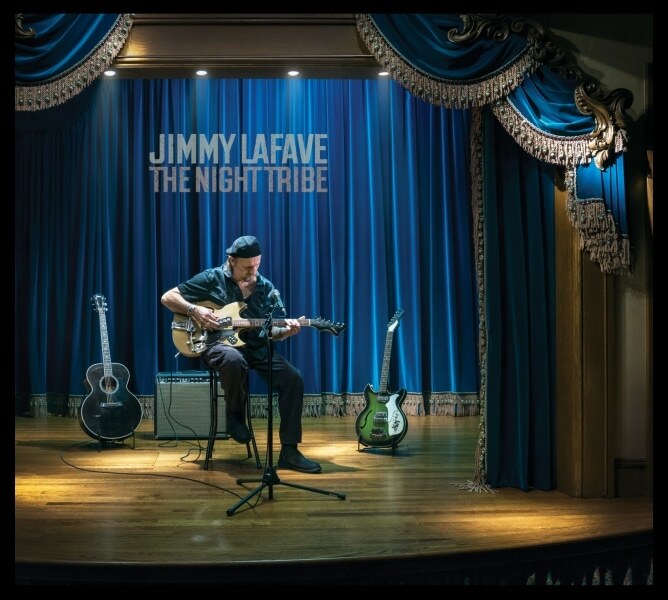 Starting in 1992 with his Austin Skyline debut, there was never any doubt about the debt the Oklahoma raised, Texas based Jimmy LaFave owed to his biggest inspiration Bob Dylan. From the album title’s riff on Nashville Skyline to numerous covers that have peppered subsequent releases in LaFave’s thick back catalog, he has created a cottage industry of sorts interpreting Dylan songs alongside his own originals. For better or worse (largely the former), LaFave hasn’t shifted gears much from his first recordings over three decades ago. A few rustic rockers mesh with lovely, understated melodies, all of which are enlivened by the singer’s scratchy, raw and thoroughly distinctive voice that sounds more like Steve Forbert as they both age. Almost anything from this terrific new batch of rootsy folk-rockers could have been included in any earlier album. As usual, LaFave is not shy about his influences, including an obscure Neil Young track (“Journey Through the Past”) along with what is by now a de rigueur version of a Dylan gem. For the latter he dips into the bard’s early years for a seldom performed “Queen Jane Approximately” which expands from a stripped down beginning to a full blown finale complete with backing vocals and strings. But LaFave’s own songwriting talents are as striking as his interpretive skills. The opening “The Beauty of You” is not only one of his finest spiritually based songs, but a sweet, honest love song that could easily apply to a romantic partner. He adds blues and atmospheric noir strings for the evocative title track that describes and embraces those who live in the “neon glow” of late night jobs, as he has for all these years. Gospel female backing singers bring soul to the regretful mid-tempo “Never Came Back to Memphis,” another one of many highlights that seem to effortlessly drop from LaFave’s pen. From the swampy J.J. Cale-styled restrained rock of “Dust Bowl Okies” and the Chuck Berry chugging “Trying to Get Back to You” and the exquisitely beautiful “Talk to an Angel,” there are no weak spots throughout this long but never dull 56 minute set. Those new to LaFave’s singer/songwriter talents can start here, then work back through a history that’s as rich, impressive and frustratingly underappreciated as any in his genre.